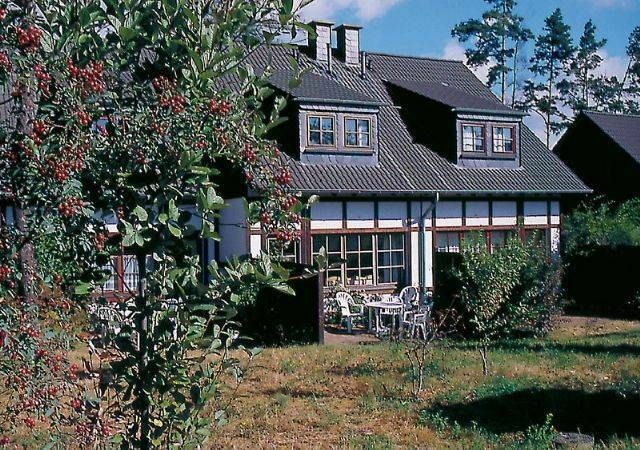 This holiday park lies on top of a hill, approximately 2 km from the cozy village of Stromberg. Your accommodation is situated in the middle of the woods, yet just a few steps away you can find an 18-hole golf course (complete with driving range & putting green) as well as many Nordic walking/hiking routes. In the immediate vicinity there are a number of activities suitable for both young and old such as horseback riding, adventure playground, forest educational trail and challenging mountain bike routes. A tennis court is also close by. Furthermore, all guests have free admission to the Schindeldorf pool in the town of Rheinböllen (12 km). The Erbeskopf ski area is within 50 kilometers. Of course in winter you should not miss the joy of tobogganing from Forsthaus Lauschhütte! This "Type Colmar" is a luxurious five-room apartment of 97 m2. On the ground floor of this spacious house you will find a living room with a sitting area (complete with color TV) and a dining area plus a kitchen with four hotplates. There is a separate toilet and a small bedroom furnished with two single beds on the ground floor as well. The upper floor has two bedrooms each furnished with a double bed plus a third bedroom furnished with a bunk bed. There is a bathroom equipped with two showers and a toilet. The accommodation has a beautiful terrace complete with patio furniture. This idyllic apartment is suitable for eight persons and offers the opportunity to enjoy a relaxing holiday. Important! If client wishes Bed Linen or Textile packet, please inform us in the booking! Smoking is not allowed in the house - only on the balcony or terrace. Free entrance to the Water park Rheinböllen on all days! Laundry package includes bed linen, bath towel and face towels. Possible on request and prior to arrival! Without prior notification, no guarantee! Stromberg, situated near the Rhine and Mosel, is a typical village of the "Hunsrück" area is and is a part of UNESCO's World Heritage list. The city of "Three Castles, Three Hills and Three Valleys", Stromberg and its surroundings are a popular holiday destination. Sightseeing in the Mittel Rheintal includes impressive relics from an eventful past: fortress walls, medieval towers, castles and patrician houses. But the beautiful cascading vineyards and cities of Mainz (Domstad), Wiesbaden and Binz, plus the old Roman town of Koblenz, are all rich in art and culture and are certainly worth a visit. Or walk for hours through the forest and discover this beautiful and romantic environment. Because of its location - in the midst of a wine region and nearby a forest - the regional cuisine in and around Stromberg is quite varied. In short, all the ingredients are present for a pleasant stay in the charming landscape of the Hunsrück!